Hackathon participants Zara Palevani and Konstantyn Volotka – many screens, many solutions. 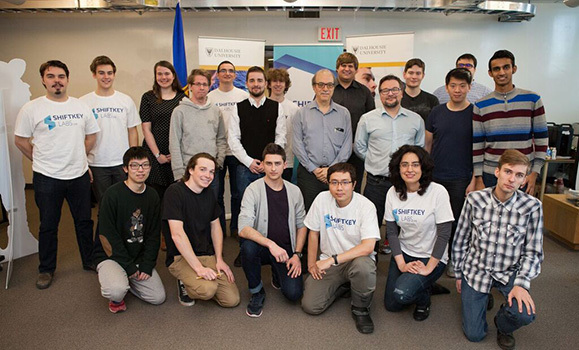 Earlier this month, the Dal-hosted ShiftKey Labs and IBM teamed up to offer post-secondary students from across Nova Scotia the opportunity to find compelling, innovative uses for government data. The “hackathon” event, held International Open Data Day (March 5), saw students using an IBM cloud-computing platform and data sets available through the Nova Scotia Government’s Open Data Portal (ODP) as they competed for $2,250 in prize money. The idea was simple: students would build analytical applications that leveraged the rich data sets available through the ODP — public government data covering areas such as business and economy, communities and social services, government administration, and nature and environment. It was up to the teams to decide whether to use one data set, or a combination of many, to d efine a challenge and develop an innovative solution. 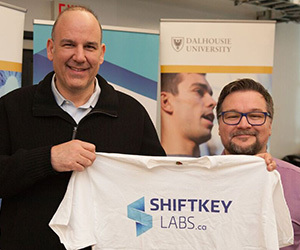 The event was held at ShiftKey (the Dal-hosted information communications technology sandbox space) in the Goldberg Computer Science Building, and kicked off with an introduction from the Honourable Labi Kousoulis, Nova Scotia's Minister of Internal Services (left, with ShiftKey Labs program director Grant Wells). He welcomed the 20 student participants, mostly undergraduates, who showed up despite a snowstorm. Their tool for the day was IBM's Bluemix, a cloud platform-as-service that combines IBM software, third party and open technologies. A key piece of the Bluemix platform revolves around analytics: in order to build apps and services that can intuitively respond to behaviours — and the world around them — people need to be able to establish context and create a personalization of data. With the help of IBM experts, students used the Bluemix platform to tackle their challenges and data sets. By Sunday, teams had to create a good idea and a basic prototype of an app or service. IBM and other industry partners completed the judging. 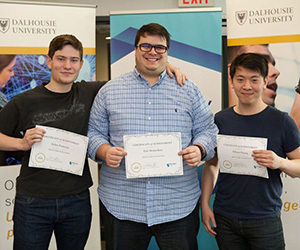 A team of three third- and fourth-year Computer Science and Informatics students (Dylan Pomeroy, Eric Desjardins, and Wilson Chiang) was behind the winning app, Food Piper, designed to connect customers to local restaurants. Food Piper uses publicly-available data to locate food establishments, while also highlighting specials and package deals. The team used Bluemix’s capabilities to scrape data, quickly build a database and model it into a map suitable for a number of different devices. The team behind Food Piper intends on trying to develop their idea into a commercial product supported by ShiftKey Labs. Other products included an extreme-event app that used a published open data set describing abandoned mines; an app that blended open-data listings of all hospitals and clinics with a plan of acquiring real-time data about emergency care wait times; an app to identify when rising sea levels would cause an area to be underwater; and one designed to share areas of items of interest (schools, jobs, etc.) with people moving to a new neighbourhood. Speaking about the event, Minister Kousoulis described the Government of Nova Scotia’s goal of allowing individuals, businesses, students and researchers alike to use the Open Data Portal to apply fresh eyes to public problems or to create jobs and business opportunities. "It’s my hope the students who took part in the hackathon used data to look at a problem through a different lens – or used two seemingly unrelated datasets to spur a business idea they can grow in Nova Scotia," he said. Opportunities like the hackathon also allow for more collaboration within industry and give students the opportunity to explore really rich publicly available data. With no context set in place, students have the freedom to be innovative.